Back from holidays. Back to brewing. Back to black. Yep, Saturday was the first weekend back from a two week holiday overseas. It seamed like a perfect idea to get Chas over and brew again. Plus we were able to do another dark brew. Super Stout was the brew for the day, and is was very dark brew indeed. Last dark brew I did was the Baltic Porter #2. That was back in November, nearly six months ago. That’s running very low and will likely be all gone by the time the Super Stout is ready to drink. The weather is getting right for stouts and porters, it has already gotten pretty cold here in Melbourne. But that might have more to do with the temperature difference between the holiday overseas verse back home. The brew day was a simple and easy one. Did a kit from Brewcraft / Liquorcraft / Australian Home Brewing… I’m always getting confused by their name. I’m just going to continue to refer to that company by their official company name, Australian Home Brewing Pty Ltd. Anyway, the kit was their Super Stout. Got this one as a gift for Christmas. Didn’t want to wait much longer before using the ingredients. Apparently liquid malt can go a bit funny if it’s been in a can too long. Yeast was fine as I kept in the fridge since December. The kit comes with everything you need. A fairly simple kit and very easy to make. The liquorice was unexpected. I’ve seen it as an ingredient in home brew shops before but wasn’t game to try myself. Given that it’s included in a lot of stout recipes I’m sure it’ll be fine. We’ll wait for the tasting review. Process for this brew is very simple. Boil 2-3 litres of water. Heat off. Add both cans of liquid malt. Add corn sugar. Stir until dissolved. Add to fermentation vessel. Top up to 18 litres. Add licorice. Stir up really well. Gravity reading. Pitch yeast. Done. The whole brew was all done in about an hour. Topping up the water was nearly the longest process. There was plenty of ice and ice cold water ready to chill. The delay was getting the rest of the water filtered. The water quality isn’t the best here due to the pipes. There is only one filtering jug and it takes time. Might need to prepare that better next time. 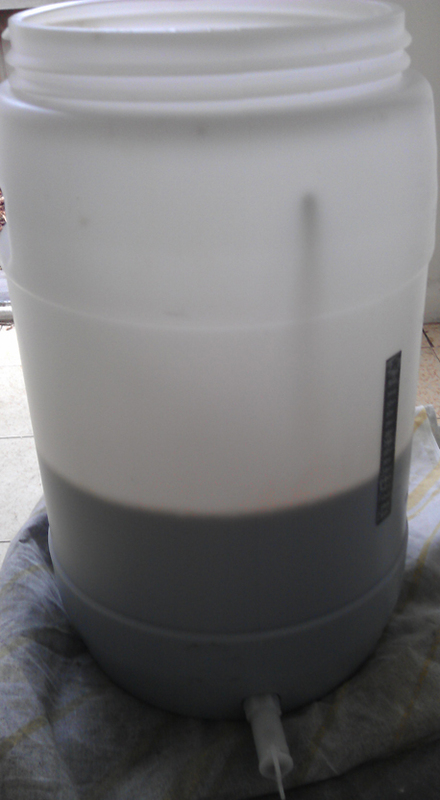 Gravity came in at 1.064. That’s pretty good. The instructions pack said final gravity would come in around 1.025 – 1.030. If that’s the case I’m looking at a beer that will be around 5.0% to 5.6% after bottling. That’s okay, but was hoping for something a bit higher for a stout. I drank some of the gravity sample and it tasted great. Dark and sweet, exactly what you’d expect. There was some beer tastings as well. Cracked open a bottle of Chas’s basic pale ale. Also tried my Australian IPA. Both reviews should make their way up over the next week or so. Overall it was a relaxed brew day. Nothing complex. Nothing boring. Nothing special. Two guys making a beer and taking it easy. Nice.